· Be patient waiting for the right property. Once you begin searching for a home, start developing a plan for moving your belongings and horses. Sell or give away the possessions from the house and the barn that you do not need. The fewer the things you have to move, the easier your move will be. · Organize, pack according to room, and clearly label each box. Even for the barn, label the boxes that belong in the tack room, feed room, or storage sheds. When unloading and unpacking the boxes, the process will move more smoothly if everything has an exact location. · A few weeks before the moving date, check that your trailer and truck are ready to haul. If you are renting a moving truck, reserve that well in advance too. · Prepare a list of phone numbers for your new home. Have the numbers of vets, farriers, and local emergency services. You always want to be prepared for the unexpected, especially with horses. · Remember that packing always takes longer than expected. Packing is not an exciting activity and sometimes retaining the motivation to finish packing is difficult. Try to give yourself a couple extra days to pack, just in case packing drags out. · Grab paper and painters tape, and label each room according to how you labeled your boxes. This way when unloading your boxes, there is no misunderstanding between what’s the living room versus dining room. 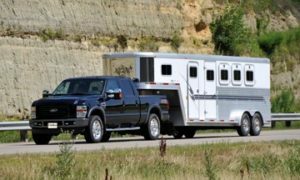 · Before unloading your horses, check the premise for safety hazards. Walk around the stalls and pastures, checking for nails, holes, wires, loose boards, etc. Make sure that all stalls and gates close properly as well. With the chaos of moving, the last thing you want is a loose or injured horse. · Call your friends! The more people you recruit, the easier the unloading process will be. Don’t forget to use your horse friends too, as they can help setting up the barn and checking on your horses. · Have a few days worth of grain and hay pre-packed. Label and measure each grain serving before moving. This way if you are working on unpacking, you can easily go to the barn, feed the horses within 15 minutes and get back to work. Your horse friends can always help feed too!